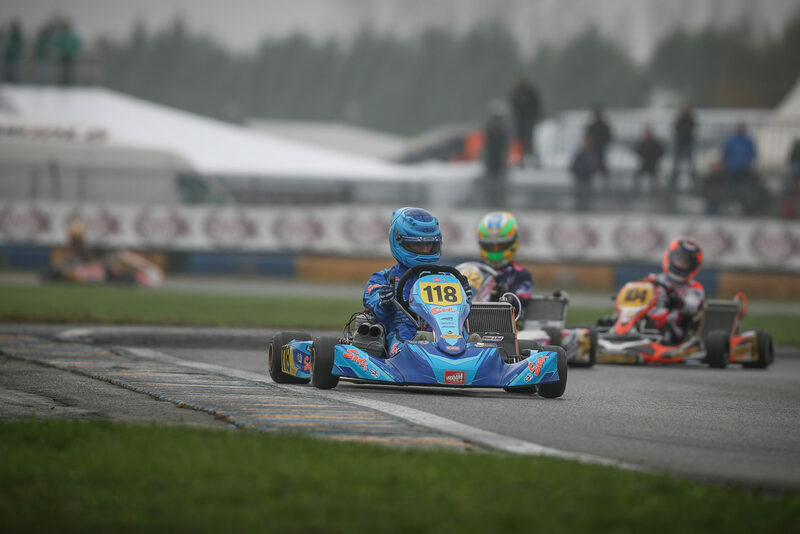 After cold and rainy conditions on Friday, a dry weather took over for the second day of competition on the 7 Laghi Kart Circuit of Castelletto di Branduzzo, host of the second round of the 2018 WSK Final Cup. If Friday was mainly about Qualifying and a first round of Heats to get everyone warmed up, this Saturday saw the 192 drivers within the four categories in play take to the track for the remaining Qualifying Heats. All of them with one goal in mind: to get a golden ticket for Sunday’s Prefinals and Finals! Kirill Smal (Tony Kart-Vortex) emerged in the Junior class with three Heats won (out of four) to put himself on pole position for the PreFinal A, due to kick off the track festivities on Sunday morning. Dilano Van’t Hoff (Exprit-TM) has managed to win one race to accompany the Russian at the forefront with the current category leader Taylor Barnard (KR-Parilla) in third (two Heats in the pocket) alongside James Wharton (FA Kart-Vortex), twice finishing in the runner-up’s shoes. As for the PreFinal B, it will see Rosberg Racing’s new protege Kimi Andrea Antonelli (KR-Parilla) start from pole with his fellow countryman Gabriele Mini’ (Parolin-TM) in P2. Kai Askey (FA Kart-Vortex) and Federico Cecchi (Tony Kart-TM), winner of his second Heat, will be together on the following row. Despite a semi-cold start (P5) on Friday, Lorenzo Travisanutto (KR-Parilla) kept his momentum from Lonato going with two wins under his belt to secure the first spot of the PreFinal A starting grid alongside Kas Haverkort (CRG-TM), winner of one Heat. The PreFinal B grid will be lead by Danemark’s Nicklas Nielsen (Praga-Vortex), who ended up second in the provisional classification with P2 as his best personal result. Ricky Flynn Motorsport’s leading man Harry Thompson (FA Kart-Vortex) will start by his side while the likes of Bence Kovacs Zsombor (Praga-Vortex) or Leandro Anderruti (KR-Parilla) will try to catch one’s attention from third place on their respective PreFinal grids. 60 Mini: A Badoer-Powell front row! The youngest class on track saw a powerful performance pulled off by Brando Badoer (Parolin-TM) with three wins and a second place to clinch pole position and the maximum amounts of points regarding the Final Cup’s rankings. Despite two victories, Lonato’s winner Alex Powell (Energy Corse-TM) struggled a bit with two P4 finishes that will make him start second on the PreFinal A grid alongside his toffest opponent for the title. The PreFinal B grid will be composed of Christian Bertuca (Parolin-TM) on pole thanks to two wins and Baby Race’s Koskun Irfan (Parolin-TM) in second place. His teammate Ean Eyckmans (Parolin-TM) will be third with German Foteev (Energy Corse-TM) in fourth position. Finishing second of his first Heat on Friday afternoon, pole-sitter Adrien Renaudin (Sodi-TM) had a good day at the office in the gearbox class by winning the second and third Heats on schedule. The latest despite a 3-second penalty for a wrong positioning of the front fairing, as for his two closest opponents this weekend, Axel Bengtsson (Kosmic-Vortex), second in the QH2 before retiring in the QH3, and Emilien Denner (Kalikart-TM), who ended up in P6 after two consecutive third places. Overall, Renaudin will start the Prefinal from pole position with the Dutchman Dylan Davies (DR-Modena) by his side, Cyril Ratl (CRG-TM) in third followed by Denner, fourth, and Bengtsson, fifth. The third and last day of the 2018 WSK Final Cup’s round 2 on the 7 Laghi kart circuit in Castelletto di Branduzzo will start tomorrow at 8:40 with the warm-up sessions followed from 10:50 by the Prefinals. The first Final of the day (OKJ) will start at 14:00. Don’t miss the on-track action with the Live Timing and Live Streaming (on Sunday, Nov. 11th) brought to you by WSK Promotion.